The first two books of the Cy-Ops Sci-fi Romance series, Stranded with the Cyborg and Mated with the Cyborg, have progressed from the nomination round of The Romance Reviews’ (TRR) Readers’ Choice awards to the Voting Round. Both books are in the “Romantic Science Fiction – Futuristic” category. Thank you to everyone who voted! Can I please ask you for vote one more time? During this final Voting Round, April 4-30, the winners, the Readers’ Choices, will be decided. If you enjoyed either or both books, would you please cast your ballot? This is a new series for me, and one of the books was named Readers’ Choice, it will get a little extra publicity from TRR. Available in audiobook and ebook. Free with Kindle Unlimited. 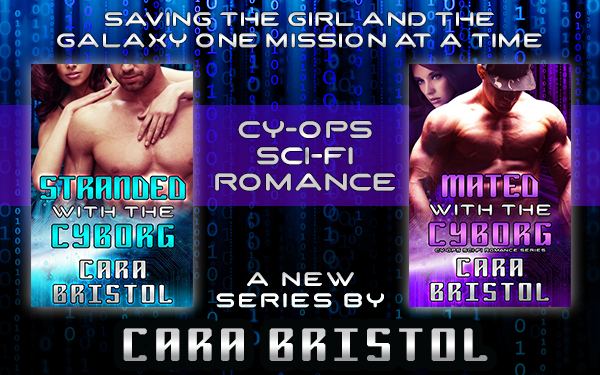 This entry was posted in Contests, My romances and tagged 2016 Summer TRR Readers' Choice Awards, Cara Bristol, Cy-Ops Sci-fi Romance series, Mated with the Cyborg, romance readers, science fiction romance, Stranded with the Cyborg. Bookmark the permalink. I voted for both. Hope you win!